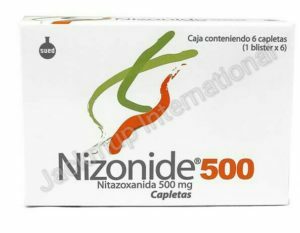 Description:- Nizonide 500mg tablet is used in the treatment of diarrhoea and parasitic worm infections. It belongs to the class of medications called antiparasitic and antiviral agents. It inhibits the production of certain chemicals and substances essential for energy metabolism and growth of the parasite. It is better to take Nizonide 500mg tablet with food.